We are getting close to releasing SimpleRockets 2. We are close enough that we are ready to commit to actual date: November 8th. In the meantime, here's a new trailer to whet your appetite. 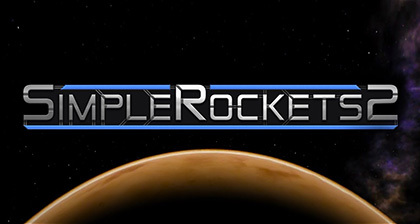 Don't forget to add SimpleRockets 2 to your Steam Wishlist so you will receive a notification when it's released. Here's the Steam page for SR2. @AndrewGarrison I don't got steam because I don't got a computer, lol, I'm all set for mobile. sounds like a good plan though, kinda like quality over quantity. Finish the game and make it good and basically bugless, then make it available on other platforms, instead of making like 6 different platform specific versions that all have their own bugs and having to individually fix the same bug on a different platform each time. It's just common sense when you look at it like that! Oh yeah it is near !! @CoBros2 The game won't unfortunately be released on Android tomorrow but only PCs, I think the price on Android will be about $4-5. @AndrewGarrison I know this might be late, because by the time you respond I will already have the game,but what will the price be for android? I know you are going to say, "It's 9:00 AM, not 10:00 AM!" The 9:00 AM time is in Central Standard Time. I live in Eastern standard time, which is 1 hour after 9:00 AM. I am at school at 10pm, sadly. Yay! The Official release is in 13 hours! Official release tommorow! Cant wait! :) it is very near! @Voltaia 8AM CST is the official time. @DrCoconut1245 $14.99 with a 15% launch discount. @NYINYI98 If you want a free copy you should go somewhere else.